The potent nitrogen-containing bisphosphonate zoledronate inhibits farnesyl pyrophosphate synthase, a key enzyme of the mevalonate pathway that is often hyperactive in malignant cells. Zoledronate activates human Vγ9Vδ2 T cells, which are immune sentinels of cell stress and tumors, through upstream accumulation of the cognate Ag isopentenyl pyrophosphate. IL-18 was shown to enhance zoledronate-induced γδ T cell activation. Although monocytes have been considered important accessory cells that provide the Ag isopentenyl pyrophosphate, CD56brightCD11c+ NK cells were postulated to mediate the costimulatory effects of IL-18. We report in this article that downstream depletion of geranylgeranyl pyrophosphate (GGPP), which is required for protein prenylation, caused cell stress in monocytes, followed by caspase-1–mediated maturation and release of IL-18, which, in turn, induced γδ T cell CCL2. Likewise, zoledronate caused a substantial delay in γδ T cell expansion, which could be skipped by GGPP supplementation. Moreover, repletion of GGPP, which prevented acute zoledronate toxicity, and supplementation with IL-18, which strongly upregulated IL-2Rα (CD25) and favored the central memory phenotype, were sufficient to enable zoledronate-induced expansion of highly purified γδ T cells, even when starting cell numbers were as low as 104 γδ T cells. Our study reveals essential components of γδ T cell activation and indicates that exogenous IL-18, which can directly costimulate γδ T cells, eliminates the need for any accessory cells. Our findings will facilitate the generation of robust γδ T cells from small blood or tissue samples for cancer immunotherapy and immune-monitoring purposes. The recent observation that mutant p53 enhances mevalonate metabolism in malignant cells and that mevalonate pathway inhibitors can reverse the malignant phenotype (1) reinforce the view that the mevalonate pathway for eukaryotic isoprenoid biosynthesis (2) is an important therapeutic target (3). Nitrogen-containing bisphosphonates (N-BPs) inhibit farnesyl pyrophosphate (FPP) synthase, which is a key enzyme of the pathway. N-BPs are widely prescribed to treat osteoporosis and similar diseases, but they also have been approved for the treatment of metastatic bone disease in hematopoietic tumors, such as multiple myeloma (4), as well as nonhematopoietic tumors, such as breast (5) and prostate cancer (6). N-BPs can affect tumor biology either directly (7, 8) or exhibit indirect antitumor effects through stimulating tumor immune surveillance (9, 10). A number of immunomodulatory effects of N-BPs have been described (3, 11–15). The ability of N-BPs to stimulate γδ T cells was discovered more incidentally when patients with bone disease had increased frequencies of γδ T cells after their first pamidronate administration (9). In an attempt to explain this clinical observation, N-BPs initially were suggested to be cognate phosphoantigens that can be directly recognized by γδ T cells (direct pathway). Isopentenyl pyrophosphate (IPP), which accumulates as a consequence of N-BP–induced inhibition of FPP synthase, was later identified as the true cognate Ag that is recognized by the Vγ9Vδ2 TCR (indirect pathway) (16–18). However, the context of IPP recognition by the Vγ9Vδ2 TCR remains elusive. The Ag-presenting element awaits identification, and accessory cell requirements of γδ T cell activation are still poorly defined (19). Although monocytes were postulated to be required as a source of IPP in zoledronate-induced γδ T cell responses (20), primary human MHC class II+ cells were recently reported to be indispensable for γδ T cell expansion in response to stimulation with phosphoantigens (21). Although γδ T cells perform innate-like responses during the early phase of an immune reaction, attempts have also been made to define naive and memory subsets based on the expression of CD45RA and CD27 Ags (22). Among N-BP–expanded γδ T cells, effector/memory-like T cells (TEMs, CD45RA−CD27−) predominate (23) and, in patients with certain hematologic malignancies, poor proliferative response to zoledronate, which is the most potent N-BP available for clinical use, correlated with an even more pronounced bias toward TEM and terminally differentiated effector memory T cells re-expressing CD45RA (TEMRA, CD45RA+CD27−) (24). By monitoring endogenous IPP levels, γδ T cells contribute to stress and tumor immune surveillance (10, 19, 25, 26). The concept of γδ T cell–mediated tumor immune surveillance has been tested in clinical trials of zoledronate in combination with rIL-2. Although clinical responses were observed in these trials, failure to expand robust γδ T cell populations in response to treatment frequently occurred and also correlated with unfavorable clinical courses (23, 27). Moreover, poor proliferative response of Vγ9Vδ2 T cells to zoledronate in vitro was found to be a negative prognostic indicator in chronic lymphocytic leukemia (24). Although upstream accumulation of IPP during N-BP–mediated FPP synthase inhibition provides Ag for the specific stimulation of γδ T cells, the downstream depletion of FPP and geranylgeranyl pyrophosphate (GGPP) was shown to generate cell stress and to translate into caspase-1–dependent inflammatory responses, both in vitro and in vivo (3, 28–30). IL-18, which is a stress-related, caspase-1–processed cytokine (31), was implicated in zoledronate-induced NK cell and γδ T cell activation (29) and was shown to costimulate zoledronate-induced, IL-2–driven γδ T cell expansion (32). A population of CD56brightCD11c+ NK cells was postulated to mediate the stimulatory effect of IL-18 in zoledronate-induced γδ T cell expansion (33). In addition, B7-CD28, as well as CD27-CD70, costimulatory signals were reported to control survival, proliferation, and cytokine production of γδ T cells (34, 35). In the present study, we discovered how upstream and downstream events of zoledronate-induced mevalonate pathway regulation translate into an early cytokine response, which involves the stress-related cytokine IL-18 and the IL-18–dependent γδ T cell chemokine CCL2, as well as a significantly delayed γδ T cell–proliferative response. We perform reconstitution with downstream prenyl pyrophosphate to eliminate zoledronate toxicity and to skip the proliferative delay. Finally, we combine prenyl pyrophosphate reconstitution with IL-18 costimulation to enable zoledronate-induced and IL-2–driven expansion of highly purified γδ T cells in the absence of any other accessory cells. Thus, our work defines essential components of zoledronate-induced γδ T cell activation and lymphoid stress surveillance. Zoledronate and human rIL-2 were from Novartis. Human rIL-1β was from R&D Systems; human rIL-18 was from Medical and Biological Laboratories. Anti-CD3 (SK7–PerCP–Cy5.5), anti-CD14 (MΦP9-FITC, MΦP9-allophycocyanin), anti-CD25 (2A3-PE), anti-CD27 (M-T271–allophycocyanin), and anti-CD45RA (HI101-PE-Cy7) were from BD Biosciences; anti-TCR Vδ2 (IMMU 389-FITC) and anti-CD56 (either NKH-1–PE or NKH-1–allophycocyanin) were from Beckman Coulter; fixable viability dye eFluor 780 was obtained from eBioscience. GGPP was obtained from Echelon Biosciences. Caspase-1 inhibitor Ac-Tyr-Val-Ala-Asp-2,6-dimethylbenzoyloxymethyl-ketone (YVAD; solvent: DMSO) was purchased from Alexis Biochemicals. Neutralizing anti–IL-18 (125-2H) was from MBL. All donors gave written informed consent, in accordance with the Declaration of Helsinki, to the use of their residual buffy coats for research purposes, with approval from the University Hospital of Innsbruck Review Board. Cell isolation or depletion was performed using MACS technology from Miltenyi Biotec. In some experiments, PBMCs were depleted of monocytes (CD14 MicroBeads), CD56+ cells (CD56 MicroBeads), or all typical accessory cells (HLA-DR MicroBeads) using LD columns. Monocytes were isolated using CD14 MicroBeads and LS columns. 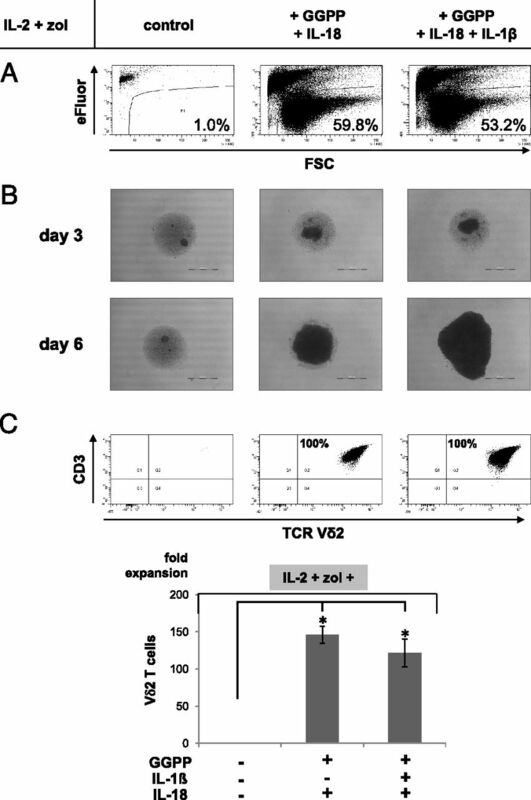 Untouched γδ T cells were isolated from PBMCs using the TCRγδ T Cell Isolation Kit (Miltenyi Biotec), which is based on a negative-selection procedure, during which all non–TCR-γδ cells were depleted. All procedures were performed according to the manufacturer’s instructions. Cell purity was always evaluated by flow cytometry, and cells were used when purity was >95%. All cell cultures were performed in complete RPMI 1640 supplemented with 10% FBS. 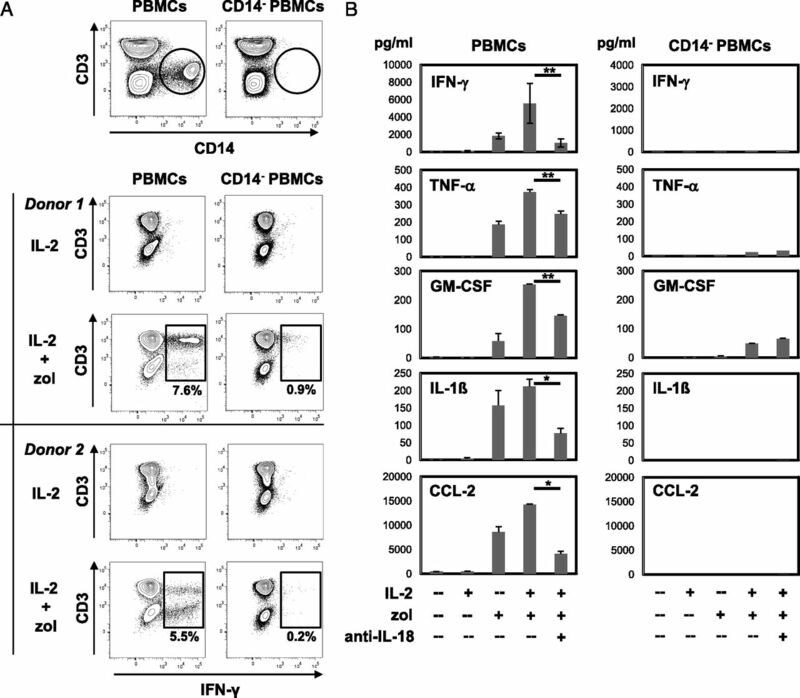 For γδ T cell expansion, total PBMCs, subset-depleted PBMCs (1.5 × 106/ml), or purified γδ T cells (5 × 104 to 5 × 105 cells/ml) were stimulated with IL-2 (100 U/ml) either alone or in combination with zoledronate (10 or 30 μM). Although zoledronate, GGPP (10 μM), IL-18 (200 ng/ml), and IL-1β (5 ng/ml) were added as an initial single dose, fresh IL-2 was added every 2–3 d. After the time indicated, cells were collected, counted, and subjected to flow cytometry. Cells were stained for CD3 and Vδ2 TCR to determine γδ T cell frequency, both in the starting populations (day 0) and in the final populations (day 7, 10, or 14/15). Absolute numbers of γδ T cells in the individual cultures were then derived from total cell numbers, considering γδ T cell frequency, and used to quantify γδ T cell expansion. Fixable viability dye eFluor 780 was used to label dead cells prior to flow cytometric analysis. Levels of cytokines (IFN-γ, TNF-α, IL-1β, GM-CSF, CCL2, and IL-17) were assessed in culture supernatants using BD CBA Flex Sets. Samples were analyzed with a FACSCanto II flow cytometer and FCAPArray 1.0.1 software from BD Biosciences. For intracellular staining of IFN-γ, cells (2 × 106/ml) were stimulated in RPMI 1640–10% FBS with IL-2 (100 U/ml) or zoledronate (30 μM) plus IL-2 for 20 h (day 1). During the last 3–4 h, cells were treated with brefeldin A (BD Biosciences) and then were harvested, washed, and stained with fluorochrome-conjugated anti-TCRVδ2 or anti-CD3 or anti-CD14 mAb for 30 min at 4°C. Cells were washed twice and treated with FIX&PERM (AN DER GRUB Bio Research). Fixed, permeabilized cells were stained with fluorochrome-conjugated anti–IFN-γ Ab. After two more washes, the cells were analyzed with a FACSCanto II flow cytometer and FACS Diva 6.1.2 and FlowJo software version 7.2.5 (BD Biosciences). IL-18 concentrations were assessed in culture supernatants using the human IL-18 ELISA Kit from MBL. Experiments were usually set up as duplicates, sometimes even as sextuplicates, and repeated at least two times. Group comparisons were performed using the Student t test for paired samples. A p value ≤ 0.05 was considered statistically significant. Microsoft Excel and SPSS software were used for calculations. Zoledronate-induced FPP synthase inhibition has two major effects: upstream accumulation of the γδ T cell Ag IPP and downstream depletion of prenyl pyrophosphates (Supplemental Fig. 1). We showed previously that GGPP deprivation can result in functional maturation and release of IL-1β and IL-18 after proteolytic cleavage of the inactive proforms by caspase-1 and that endogenous IL-18 is the main mediator during zoledronate-induced γδ T cell activation (3, 28, 29). Because zoledronate-induced inflammatory and proliferative responses depend on IL-2 costimulation, we first examined zoledronate’s effects on IL-2Rα (CD25) expression. 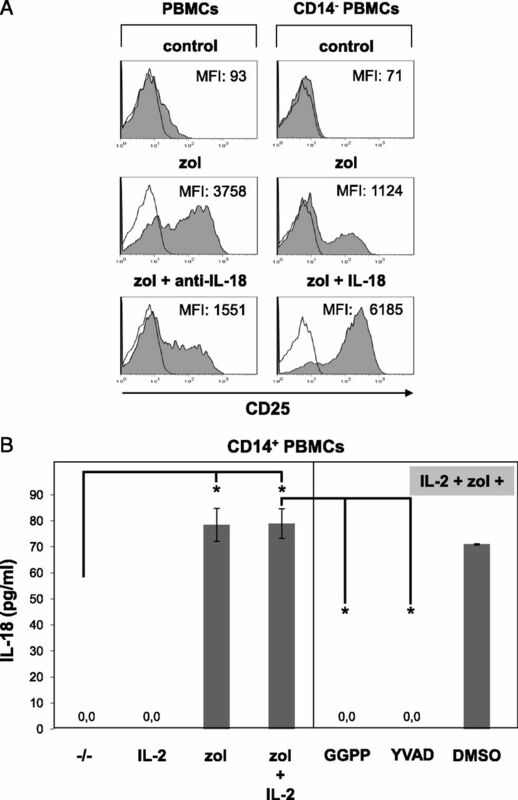 Zoledronate rapidly induced CD25 surface expression in γδ T cells (Fig. 1A). Neutralization of endogenous IL-18 reduced CD25 expression (Fig. 1A). Likewise, depletion of monocytes, which can be considered a major source of IL-18 (36) simply by virtue of their greater abundance compared with other myeloid accessory cells, also reduced zoledronate-induced CD25 expression. 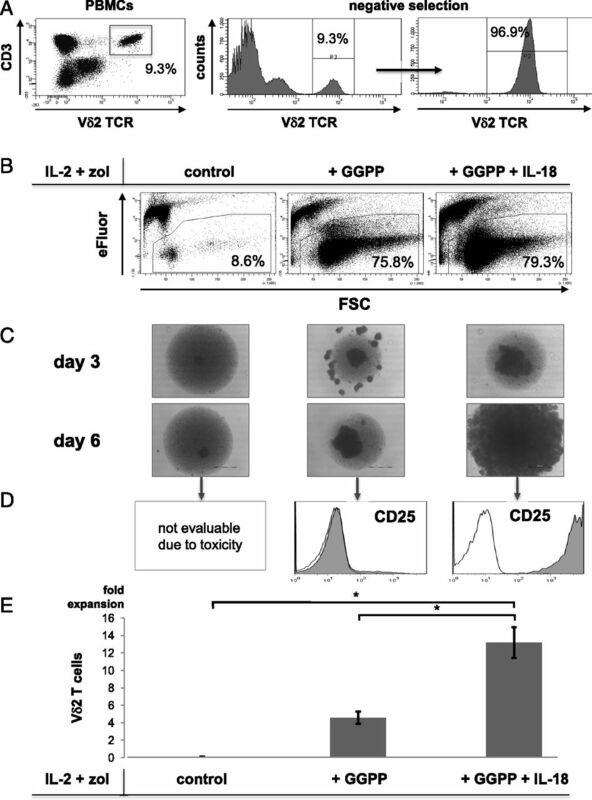 Conversely, addition of IL-18 to monocyte-depleted cultures strongly boosted CD25 expression on γδ T cells (Fig. 1A). Zoledronate-induced IL-18 contributes to the early upregulation of CD25 on γδ T cells: enhancement by exogenous IL-18. (A) PBMCs (1.5 × 106/ml) were stimulated for 20 h with zoledronate (30 μM) in the presence or absence of IL-18–neutralizing Ab. CD14− PBMCs (1.5 × 106/ml) were stimulated for 20 h with zoledronate (30 μM) in the presence or absence of rIL-18 (200 ng/ml). Cells were stained for CD3, Vδ2, and CD25. Vδ2+ T cells were gated and selectively analyzed for CD25 expression (filled graphs; isotype control: open graphs). (B) CD14+ PBMCs (i.e., monocytes: 1 × 106/ml) were left unstimulated or were stimulated for 20 h with IL-2 (100 U/ml), zoledronate (30 μM), or zoledronate plus IL-2 in the presence or absence of GGPP (10 μM) or caspase-1 inhibitor YVAD (200 μM; DMSO = solvent control). IL-18 was measured in culture supernatants by ELISA. One of three independent experiments is shown. Error bars represent SD. *p < 0.05. IL-18 was released from isolated human monocytes after stimulation with zoledronate, although at a low level (Fig. 1B). IL-2 had no effect by itself, and it did not alter zoledronate-induced IL-18. Data shown in Fig. 1B demonstrate that reconstitution with GGPP abolished IL-18 release, and inhibition of caspase-1 with the specific inhibitor YVAD (37) also abrogated IL-18 secretion (Fig. 1B), which was in accordance with our previous findings (29). IL-18 is known principally for its ability to induce IFN-γ production, and cytokines, such as IL-2, can cooperate with IL-18 to enhance IFN-γ production in a synergistic fashion (38). IFN-γ production by γδ T cells was also readily detected intracellularly in response to stimulation with zoledronate plus IL-2 but not IL-2 alone. Two donors with either a low (0.6%) or high (10%) starting frequency of γδ T cells were examined (Fig. 2A). When the starting frequency of γδ T cells was high, IFN-γ was detected primarily in T cells, which are γδ T cells (Supplemental Fig. 2A) (29), whereas IFN-γ production was produced mainly by NK cells when the starting frequency of γδ T cells was low. Monocyte depletion strongly reduced or even abrogated IFN-γ production (Fig. 2A). The zoledronate-induced early cytokine response depends on monocytes and endogenous IL-18. (A) PBMCs or monocyte-depleted (CD14−) PBMCs (1.5 × 106/ml) were stimulated for 20 h with either IL-2 alone (100 U/ml) or with zoledronate (30 μM) plus IL-2. Cells were stained for intracellular IFN-γ and for surface CD3. Results from two independent donors with either a high (donor 1: 10%) or a low (donor 2: 0.6%) starting frequency of γδ T cells are shown. (B) PBMCs or monocyte-depleted (CD14−) PBMCs (1.5 × 106/ml) were left unstimulated or were stimulated for 20 h with IL-2 (100 U/ml), zoledronate (30 μM), or zoledronate plus IL-2 in the presence or absence of IL-18–neutralizing Ab (5 μg/ml). Cytokine levels were determined in culture supernatants using CBA flex sets. One of three independent experiments is shown. Error bars represent SD. *p < 0.05, **p < 0.01. To further examine the cytokine response, we performed cytokine bead arrays (CBAs) to assess multiple cytokines in culture supernatants. CBA results demonstrated the synergistic induction of various cytokines (IFN-γ, TNF-α, GM-CSF, IL-1β) by zoledronate plus IL-2, as well as the reduction or loss of cytokines in the absence of monocytes (p < 0.01) (Fig. 2B). Importantly, zoledronate also induced, in a strictly monocyte-dependent fashion, large amounts of CCL2 (Fig. 2B), which is also referred to as MCP-1 and has been implicated in tumor infiltration by γδ T cells (39). Neutralization of endogenous IL-18 reduced the levels of all cytokines, including CCL2. IL-17 production in response to zoledronate stimulation could not be detected. In contrast to CD25 upregulation and cytokine production, which were detectable after 20 h, γδ T cell proliferation was markedly delayed and did not begin before day 4–5 (Fig. 3). Prolonged zoledronate treatment was obviously toxic (Supplemental Fig. 3A) and prevented γδ T cell expansion. Depletion of monocytes further increased the proliferative delay (Fig. 3). Considering the possibility that toxicity was due to downstream depletion of prenyl pyrophosphates (40), which are required for protein prenylation (8), we performed supplementation experiments with GGPP, which was shown previously to be the main target of zoledronate-induced prenyl pyrophosphate deprivation (29). A single initial low dose of GGPP (10 μM), which by itself is a poor Ag (300-fold less potent than IPP) (17, 41), was able to restore the proliferative capacity of γδ T cells and to circumvent the observed delay, enabling a much faster initiation of γδ T cell expansion (Fig. 3). The zoledronate-induced γδ T cell–proliferative response is delayed but can be boosted by GGPP supplementation. PBMCs or monocyte-depleted (CD14−) PBMCs (1.5 × 106/ml) were stimulated with zoledronate (10 μM) plus IL-2 (100 U/ml) in the presence or absence of GGPP (10 μM). At the time indicated, cells were stained for CD3 and Vδ2, and γδ T cell frequency was determined. Absolute numbers of γδ T cells in the individual cultures were derived from total cell numbers, considering γδ T cell frequency, and used to quantify γδ T cell expansion. To further address the role of accessory cells and accessory cell–derived IL-18, we used cell cultures depleted of HLA-DR–expressing cells (Fig. 4A), which lacked all typical accessory cells (monocytes, dendritic cells, B cells, activated T cells). Because IL-18’s effects may be mediated by a subset of CD56bright NK cells (33), we additionally depleted CD56+ cells (Fig. 4A). Analysis of differentially depleted cell cultures on day 7 revealed a lack of cell aggregation (Fig. 4B) and a failure of γδ T cells to expand in response to stimulation with zoledronate plus IL-2 (Fig. 4C). The actual loss of γδ T cells (expansion factors < 1-fold) was indicative of strong zoledronate toxicity. Addition of GGPP prevented zoledronate toxicity but was not sufficient to induce γδ T cell expansion (expansion factors < 2-fold). However, the addition of GGPP plus IL-18 induced substantial γδ T cell expansion (>30-fold; Fig. 4C). Supplementation with GGPP and IL-18 fully restores zoledronate-induced γδ T cell expansion after accessory cell depletion. (A) PBMCs were depleted of HLA-DR+ or HLA-DR+ plus CD56+ accessory cells. The starting PBMC population and the resulting subsets were stained for HLA-DR and CD56. (B) Cell subsets (1.5 × 106/ml) were stimulated in round-bottom 96-well plates with zoledronate (10 μM) plus IL-2 (100 U/ml) in the presence or absence of GGPP (10 μM) and IL-18 (200 ng/ml). Cell aggregation was documented using an Olympus CK2 microscope equipped with a ProgRes CT3 digital camera and ProgRes CapturePro 2.5 Software (Jenoptik) (original magnification ×400). Scale bar, 500 μm. (C) Cell subsets (1.5 × 106/ml) were stimulated in round-bottom 96-well plates with zoledronate (10 μM) plus IL-2 (100 U/ml) in the presence or absence of GGPP (10 μM) and IL-18 (200 ng/ml). After 7 d, cells were stained for CD3 and Vδ2 TCR, and γδ T cell frequency was determined. Absolute numbers of γδ T cells in the individual cultures were derived from total cell numbers, considering γδ T cell frequency, and used to quantify γδ T cell expansion. Yet another important effect of IL-18 was the increase in the number of γδ T cells expressing CD56 (Supplemental Fig. 2B), which were previously reported to be more cytotoxic and more resistant to Fas ligand and chemically induced apoptosis (42). Thus, IL-18 increased the number of γδ T cells, as well as improved their robustness and functionality. The observation that γδ T cells can still expand in response to zoledronate plus IL-2 after depletion of virtually all accessory cells expressing either HLA-DR (monocytes, dendritic cells, B cells, activated T cells) or CD56 (NK cells, including CD56bright NK cells), provided that GGPP and IL-18 are present, strongly suggested that these two factors represent the only requirements for zoledronate-induced and IL-2–driven γδ T cell expansion. Therefore, we performed experiments with untouched γδ T cells highly purified by negative selection (Fig. 5A). In cultures of highly purified γδ T cells, which necessarily lacked accessory cells, zoledronate treatment was acutely toxic and killed >80% of the cells (Fig. 5B, control, Supplemental Fig. 3B). Importantly, addition of GGPP rescued γδ T cells and increased cell viability from <10% to >75% (Fig. 5B). In addition, GGPP enhanced γδ T cell aggregation in a time-dependent fashion, which is indicative of γδ T cell activation (Fig. 5C). Additional supplementation with IL-18 increased γδ T cell survival only modestly (Fig. 5B), but it induced massive γδ T cell aggregation, which is strongly suggestive of γδ T cell expansion (Fig. 5C), and it generated γδ T cells with extraordinarily high levels of CD25 (Fig. 5D). Zoledronate plus IL-2 completely failed to induce γδ T cell expansion (Fig. 5E). Addition of GGPP, which prevented zoledronate toxicity, enabled a 4–5-fold expansion of γδ T cells. Combined supplementation with GGPP and IL-18 boosted γδ T cell proliferation and increased expansion to >13-fold (Fig. 5E), clearly indicating that GGPP and IL-18 are sufficient to rescue and expand γδ T cells in response to treatment with zoledronate and IL-2. Supplementation with GGPP and IL-18 is sufficient to enable zoledronate-induced expansion of highly purified γδ T cells. 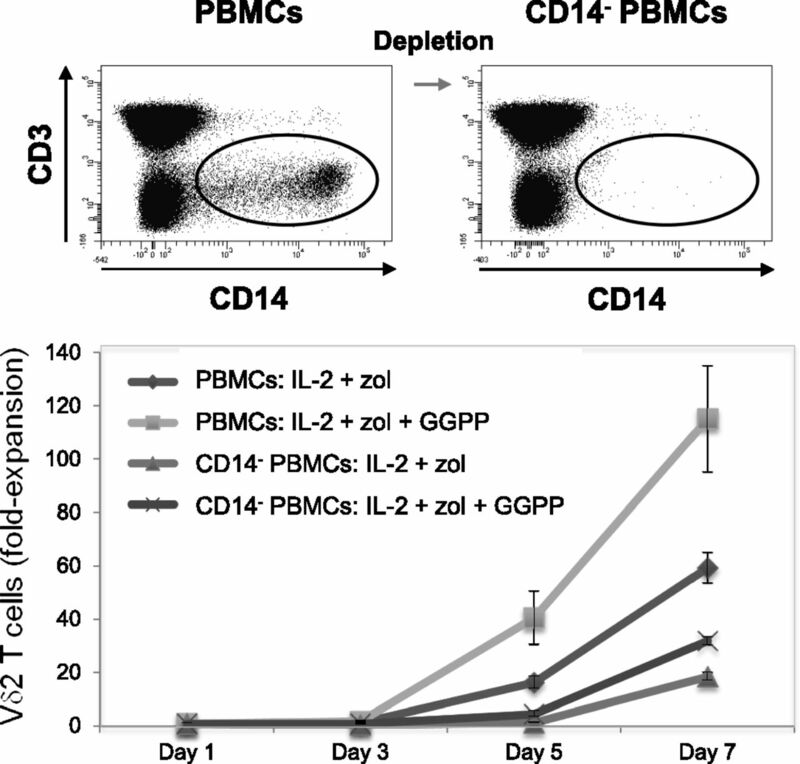 (A) Untouched γδ T cells were isolated from PBMCs by a negative-selection procedure. The starting PBMC population and the resulting γδ T cell population were stained for CD3 and Vδ2 TCR. (B) Purified γδ T cells (105 cells/96-well plate) were seeded and treated with zoledronate (10 μM) plus IL-2 (100 U/ml) in the presence of GGPP (10 μM) alone or in the presence of GGPP plus IL-18 (200 ng/ml). To assess zoledronate toxicity, cells were incubated with the eFluor viability dye and analyzed by flow cytometry. Viable cells exclude eFluor and increase forward scatter (FSC) during activation. (C) Aggregation of purified γδ T cells (105 cells/96-well plate) in response to treatment was documented using an Olympus CK2 microscope equipped with a ProgRes CT3 digital camera and ProgRes CapturePro 2.5 Software (Jenoptik) (original magnification ×400). Scale bar, 500 μm. (D) On day 7, γδ T cells were analyzed for CD25 (IL-2Rα) expression (filled graphs; isotype control: open graphs). (E) After 10 d, absolute cell numbers were determined, and γδ T cell expansion was quantified. One of three independent experiments is shown. Error bars represent SD. *p < 0.05. To further explore the capacity of this procedure, we seeded γδ T cells at a 10-fold lower cell density (104 cells/well; Supplemental Fig. 4), which is usually much too low to support effective T cell proliferation (43). Low cell density resulted in even more pronounced zoledronate toxicity, which killed virtually all γδ T cells (Fig. 6A). Addition of GGPP and IL-18 rescued γδ T cells, also at low cell density, and induced cell aggregation in a time-dependent fashion (Fig. 6B), as well as γδ T cell expansion (>100-fold) (Fig. 6C). IL-1β was unable to enhance the costimulatory activity of IL-18 (Fig. 6C). Supplementation with GGPP and IL-18 enables effective, zoledronate-induced γδ T cell amplification from small cell numbers. (A) Purified γδ T cells (104 cells/96-well plate) were treated with zoledronate (10 μM) plus IL-2 (100 U/ml) in the presence of GGPP (10 μM), GGPP plus IL-18 (200 ng/ml), or GGPP plus IL-18 and IL-1β (5 ng/ml). To assess zoledronate toxicity, cells were incubated on day 15 with the eFluor viability dye and analyzed by flow cytometry. Viable cells exclude eFluor and increase forward scatter (FSC) during activation. (B) Aggregation of purified γδ T cells (104 cells/96-well plate) in response to treatment was documented on days 3 and 6 using an Olympus CK2 microscope equipped with a ProgRes CT3 digital camera and ProgRes CapturePro 2.5 Software (Jenoptik) (original magnification ×400). Scale bar, 500 μm. (C) After 15 d, cells were stained for CD3 and Vδ2 to confirm γδ T cell identity. Absolute cell numbers were determined, and γδ T cell expansion was quantified. One of three independent experiments is shown. Error bars represent SD. *p < 0.05. In the presence of GGPP, which is essential to avoid zoledronate toxicity (Figs. 4–6), the final γδ T cell population consisted mainly of TEMs (Fig. 7A). Additional supplementation with IL-18 induced massive expansion (Fig. 6) and substantially increased the central memory T cell subset (TCM: CD45RA−CD27+), resulting in an almost even distribution of TEMs and TCMs (n = 4, p < 0.05); this was not affected by additional supplementation with IL-1β (Fig. 7A). γδ T cells expanded from small cell numbers with zoledronate in the presence of GGPP and IL-18 have a mixed central memory/effector memory phenotype and produce large amounts of cytokines. (A) Purified γδ T cells (104 cells/96-well plate) were treated with zoledronate (10 μM) plus IL-2 (100 U/ml) in the presence of GGPP (10 μM), GGPP plus IL-18 (200 ng/ml), or GGPP plus IL-18 and IL-1β (5 ng/ml). On day 14, cells were stained for CD3, Vδ2, CD45RA, and CD27. TCM (CD45RA−CD27+) and TEM (CD45RA−/CD27−) phenotypes of γδ T cells (CD3+/Vδ2+) were determined by flow cytometry (upper panels). Isotype control staining for CD27 (IgG1) and CD45RA (IgG2b) was performed with γδ T cells treated with zoledronate plus IL-2 in the presence of GGPP plus IL-18 and IL-1β (lower panel). One of four independent experiments is shown. (B) Purified γδ T cells (104 cells/96-well plate) were treated with zoledronate (10 μM) plus IL-2 (100 U/ml) in the presence of GGPP (10 μM), GGPP plus IL-18 (200 ng/ml), or GGPP plus IL-18 and IL-1β (5 ng/ml). Cytokine levels were determined in day-7 culture supernatants using CBA flex sets. One of three independent experiments is shown. Error bars represent SD. *p < 0.05. n.s., Not significant. The resulting γδ T cells also had the capacity to produce large amounts of the prototypic γδ T cell effector cytokine IFN-γ (Fig. 7B). Importantly, γδ T cells also produced substantial amounts of GM-CSF, which is known to act as an adjuvant for adaptive αβ T cell immune responses by stimulating dendritic cell differentiation and survival (44, 45) (Fig. 7B). IL-17 was completely undetectable, even in γδ T cell cultures containing IL-1β, which was previously shown to support differentiation of IL-17–producing Vγ9Vδ2 T cells (46). The net effect of zoledronate-induced FPP synthase inhibition on γδ T cells results from upstream and downstream events (Supplemental Fig. 1), which translate into either stimulatory or inhibitory effects. Zoledronate-induced upstream accumulation of the cognate γδ T cell Ag IPP, which is recognized by the Vγ9Vδ2 TCR (16, 17), initiates the immediate response within hours. Early upregulation of IL-2Rα (CD25) on γδ T cells increases their sensitivity to concomitant stimulation with IL-2. Zoledronate-induced depletion of downstream intermediates has differential effects. Deprivation of prenyl pyrophosphates and, in particular of GGPP, which prevents prenylation of numerous proteins, including many members of the Ras superfamily (7, 8), triggers an early cytokine response that depends on monocytes and at least partially on endogenous, caspase-1–processed IL-18. This response also includes CCL2 production, which has not been reported before. In murine tumor models, CCL2-directed γδ T cell migration was recently shown to be responsible for tumor infiltration in vivo (39). CCL2 production depended strictly on monocytes and strongly on endogenous IL-18. Thus, stress-related and IL-18–mediated CCL2 production may guide γδ T cells to stressed tissues, including tumors. However, prenyl pyrophosphate deprivation also exhibits inhibitory effects and causes a considerable delay of several days in the onset of γδ T cell proliferation. In principle, monocytes can contribute to the zoledronate-induced γδ T cell response as a source of the specific Ag IPP or as a source of costimulatory cytokines, such as IL-18, or both. Monocytes were suggested to be responsible for γδ T cell activation induced by zoledronate through accumulation of IPP and its isomer dimethylallyl pyrophosphate (20). In the study by Roelofs et al. (20), quantitative mass spectrometry was used to demonstrate that only monocytes produce substantial amounts of IPP in response to short-term treatment with zoledronate (2 h), and this was attributed to the higher endocytic capacity of monocytes compared with lymphocytes. Thus, zoledronate rapidly accumulates in monocytes. However, a 2.5-fold increase in IFN-γ (from 10 to 25 pg/ml) and a 2.1-fold expansion of Vδ2 T cells within 7 d, induced by zoledronate-treated monocytes and reported in the same study (20), does not convincingly demonstrate the importance of monocytes as a source of IPP. Rather, results from our study emphasize the role of monocytes as a source of IL-18. 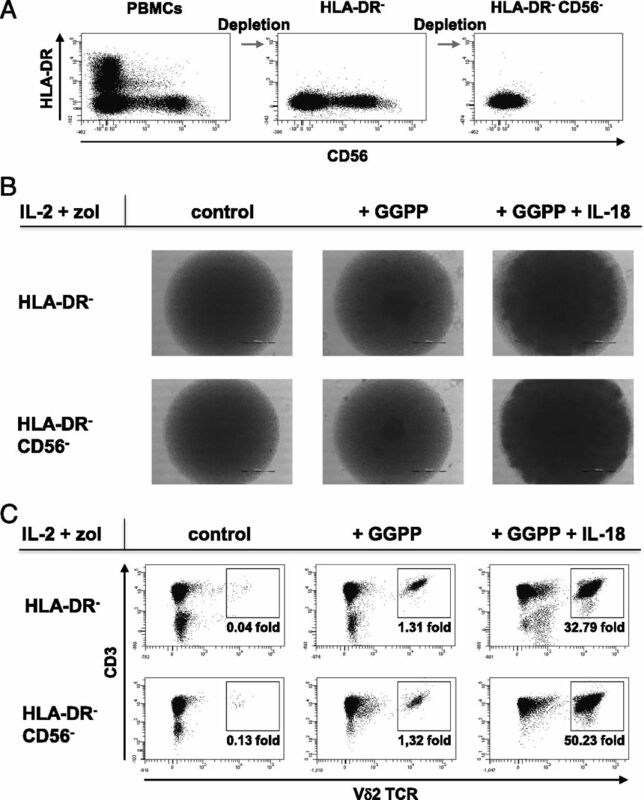 Isolated monocytes produced IL-18 in response to zoledronate, which was confirmed to be a consequence of GGPP deprivation and caspase-1 activation (29). Monocyte depletion diminished the production of all cytokines tested, either partially or completely. Likewise, IL-18 neutralization attenuated the entire cytokine response. Moreover, monocyte-derived IL-18 was important for zoledronate-induced CD25 upregulation on γδ T cells. Actually, in the complete absence of accessory cells, CD25 upregulation on γδ T cells strictly depended on exogenous IL-18. Our findings that the addition of the prenyl pyrophosphate GGPP can circumvent the proliferative delay, as well as that supplementation with IL-18 can strongly boost the proliferative response of γδ T cells in PBMCs, paved the way for the successful expansion of highly purified γδ T cells. In pure cultures of γδ T cells, zoledronate was extremely toxic. Addition of GGPP, which can restore protein prenylation despite inhibition of mevalonate metabolism (1, 29, 30), eliminated zoledronate toxicity. Further supplementation with IL-18 was sufficient to enable a vigorous proliferative response of γδ T cells in the absence of any other accessory cells. The combination of GGPP and IL-18 was very potent and permitted very effective γδ T cell expansion, even when the starting γδ T cell numbers were very low (104 cells/well). At such a low cell density and in the absence of IL-18, activated T cells undergo apoptosis, which is mediated by oxidative stress (43). Therefore, our protocol might also be useful to expand γδ T cells from small blood samples (e.g., from pediatric or lymphopenic patients) or from small tissue samples, including biopsies. The potent response of γδ T cells in the complete absence of accessory cells, including monocytes, suggested that γδ T cells can also take up zoledronate and produce sufficient amounts of IPP, a property that previously was attributed to monocytes only (20). However, Moser and colleagues (47, 48) demonstrated that activated γδ T cells can differentiate and may acquire many features of accessory cells, including increased endocytic activity, which would be required to accumulate zoledronate and to produce IPP. In addition, acquisition of accessory potential by γδ T cells activated via the TCR may enable mutual costimulation (e.g., via CD70–CD27 interactions) (35, 49). Another accessory cell type that has been implicated in zoledronate-induced γδ T cell expansion, particularly in the IL-18–mediated amplification, is the subset of CD56brightCD11c+ NK cells (33). Our observation that IL-18 can boost the expansion of highly purified γδ T cells clearly indicates that these CD56brightCD11c+ NK cells are not essential accessory cells and that IL-18 can costimulate γδ T cells directly. In our study, depletion of CD56+ cells improved zoledronate-induced γδ T cell expansion, which appears to be in contrast with previous reports (33). The apparent discrepancy may be due to the fact that depletion of CD56+ cells certainly eliminates CD56brightCD11c+ NK cells, which would otherwise support γδ T cell expansion (33); however, it also removes CD56dim cytotoxic NK cells (50), which may impair and limit γδ T cell expansion. One of the observed effects of IL-18 on γδ T cells was the upregulation of CD56 expression (Supplemental Fig. 2B). CD56+ γδ T cells were previously shown to be more cytotoxic and more resistant to Fas ligand (anti-CD95) and chemically induced apoptosis (etoposide phosphate, VP-16) compared with their CD56− counterparts (42). In addition, IL-18 was recently implicated in chemotherapy resistance (51). Application of a proteomic strategy revealed that secretion of IL-18 by stressed MCF-7 breast cancer cells contributed to their doxorubicin resistance. Likewise, IL-18 may help γδ T cells to cope with the toxic effects of zoledronate and, thereby, enable γδ T cell proliferation, even in the absence of any other accessory cells. Another important effect of IL-18 in our study related to effector/memory differentiation of purified γδ T cells in response to zoledronate stimulation. In the absence of IL-18, TEMs clearly predominated. IL-18 supplementation dramatically increased the percentage of TCMs and generated γδ T cell populations that consisted of equal proportions of TEMs and TCMs. Such a distribution may ensure immediate effector functions, such as cytokine production and cytotoxicity, as well as long-term protection (22). Like αβ T cells, γδ TCMs may have a greater capacity than do TEMs to persist in vivo and may be more efficient in mediating protection because of their high proliferative potential (52), which may be ascribed to the enduring expression of CD27 and susceptibility to CD70-mediated costimulation (35). This would clearly be desirable in clinical settings and might increase the therapeutic benefit. Therefore, IL-18–induced γδ T cells may represent those robust γδ T cells that should be harnessed in clinical cancer immunotherapy. IL-17 could not be detected in PBMCs or in purified γδ T cells, even in the presence of IL-1β and IL-18, which have been implicated in the regulation of IL-17 production in humans and mice (46, 53), respectively. The requirements for the differentiation of IL-17–producing human Vγ9Vδ2 T cells were defined recently (46). In addition to IL-1β, IL-6, TGF-β, and IL-23 must be present to enable the efficient differentiation of γδ T cells that exclusively produce IL-17. Intriguingly, these IL-17–producing γδ T cells exhibited a TEMRA phenotype (CD45RA+CD27−). This is in accordance with our own observation that IL-18–stimulated cultures of purified γδ T cells lacked IL-17 and were devoid of TEMRA γδ T cells. It is unclear whether the absence of TEMRA γδ T cell subsets (54) in IL-18–stimulated γδ T cell cultures reflects the lack of an essential differentiation factor or is simply due to the early death of these cells after they have carried out an effector function (cytolysis or cytokine production). Finally, our study also reveals critical steps of γδ T cell activation and of lymphoid stress surveillance (19, 26). By inducing the depletion of downstream prenyl pyrophosphates, zoledronate generates cell stress, which translates into inflammasome activation and caspase-1–mediated maturation and release of functional IL-18 (3, 31). The resulting inflammatory cascade involves the production of CCL2, which serves to guide circulating γδ T cells into stressed tissues, including tumors (39). Within stressed tissues, IL-18 directly costimulates infiltrating γδ T cells and enables expansion of initially rare γδ T cells, which are empowered to kill stressed cells. After all, γδ T cell–derived GM-CSF may promote dendritic cell differentiation, survival, and immunogenicity (44) and, thus, may initiate adaptive immune response. We thank Walter Nussbaumer for providing buffy coats and Wolfgang Horninger for continuous support. We appreciate the participation of the Tiroler Landeskrankenanstalten GmbH, which serves as a partner in the Oncotyrol research program. This work was supported by Oncotyrol, a center for personalized cancer medicine. The Competence Center Oncotyrol is funded within the scope of the Competence Centers for Excellent Technologies (COMET) through the Bundesministerium für Verkehr, Innovation und Technologie, the Bundesministerium für Wirtschaft, Familie und Jugend, through the province of Salzburg and the Tiroler Zukunftsstiftung/Standortagentur Tirol. The COMET Program is conducted by the Austrian Research Promotion Agency.
. 2012. Mutant p53 disrupts mammary tissue architecture via the mevalonate pathway. Cell 148: 244–258.
. 1990. Regulation of the mevalonate pathway. Nature 343: 425–430.
. 2012. Novel aspects of mevalonate pathway inhibitors as antitumor agents. Clin. Cancer Res. 18: 3524–3531.
. 2002. American Society of Clinical Oncology clinical practice guidelines: the role of bisphosphonates in multiple myeloma. J. Clin. Oncol. 20: 3719–3736. 2010. Can oral bisphosphonates really reduce the risk of breast cancer in healthy women? J. Clin. Oncol. 28: 3548–3551.
. 2005. Bisphosphonates for treatment and prevention of bone metastases. J. Clin. Oncol. 23: 8219–8224.
. 1996. Bisphosphonates: mechanisms of action. J. Clin. Invest. 97: 2692–2696.
. 2007. Post-translational modifications and regulation of the RAS superfamily of GTPases as anticancer targets. Nat. Rev. Drug Discov. 6: 541–555.
. 1999. Gamma/delta T-cell stimulation by pamidronate. N. Engl. J. Med. 340: 737–738.
. 2007. Perspectives of gammadelta T cells in tumor immunology. Cancer Res. 67: 5–8.
. 2006. The effect of zoledronic acid on the function and differentiation of myeloid cells. Haematologica 91: 1165–1171.
. 2007. Amino-biphosphonate-mediated MMP-9 inhibition breaks the tumor-bone marrow axis responsible for myeloid-derived suppressor cell expansion and macrophage infiltration in tumor stroma. Cancer Res. 67: 11438–11446.
. 2007. Zoledronic acid inhibits the function of Toll-like receptor 4 ligand activated monocyte-derived dendritic cells. Leukemia 21: 732–738.
. 2011. Immune modulation by zoledronic acid in human myeloma: an advantageous cross-talk between Vγ9Vδ2 T cells, αβ CD8+ T cells, regulatory T cells, and dendritic cells. J. Immunol. 187: 1578–1590.
. 2010. V gamma 9V delta 2 T lymphocytes efficiently recognize and kill zoledronate-sensitized, imatinib-sensitive, and imatinib-resistant chronic myelogenous leukemia cells. J. Immunol. 184: 3260–3268.
. 2011. Indirect stimulation of human Vγ2Vδ2 T cells through alterations in isoprenoid metabolism. J. Immunol. 187: 5099–5113.
. 2007. Nonpeptide antigens, presentation mechanisms, and immunological memory of human Vgamma2Vdelta2 T cells: discriminating friend from foe through the recognition of prenyl pyrophosphate antigens. Immunol. Rev. 215: 59–76.
. 2012. The multifunctionality of human Vγ9Vδ2 γδ T cells: clonal plasticity or distinct subsets? Scand. J. Immunol. 76: 213–222.
. 2013. Six-of-the-best: unique contributions of γδ T cells to immunology. Nat. Rev. Immunol. 13: 88–100.
. 2009. Peripheral blood monocytes are responsible for gammadelta T cell activation induced by zoledronic acid through accumulation of IPP/DMAPP. Br. J. Haematol. 144: 245–250.
. 2012. Primary MHC-class II(+) cells are necessary to promote resting Vδ2 cell expansion in response to (E)-4-hydroxy-3-methyl-but-2-enyl-pyrophosphate and isopentenyl pyrophosphate. J. Immunol. 189: 5212–5222.
. 2010. In vivo manipulation of Vgamma9Vdelta2 T cells with zoledronate and low-dose interleukin-2 for immunotherapy of advanced breast cancer patients. Clin. Exp. Immunol. 161: 290–297.
. 2012. Dysfunctional Vγ9Vδ2 T cells are negative prognosticators and markers of dysregulated mevalonate pathway activity in chronic lymphocytic leukemia cells. Blood 120: 3271–3279.
. 2003. Human T cell receptor gammadelta cells recognize endogenous mevalonate metabolites in tumor cells. J. Exp. Med. 197: 163–168.
. 2007. Targeting human gammadelta T cells with zoledronate and interleukin-2 for immunotherapy of hormone-refractory prostate cancer. Cancer Res. 67: 7450–7457.
. 2010. IL-2 costimulation enables statin-mediated activation of human NK cells, preferentially through a mechanism involving CD56+ dendritic cells. Cancer Res. 70: 9611–9620.
. 2011. DC-like cell-dependent activation of human natural killer cells by the bisphosphonate zoledronic acid is regulated by γδ T lymphocytes. Blood 118: 2743–2751.
. 2010. The inhibition of mevalonate pathway induces upregulation of NALP3 expression: new insight in the pathogenesis of mevalonate kinase deficiency. Eur. J. Hum. Genet. 18: 844–847.
. 2010. 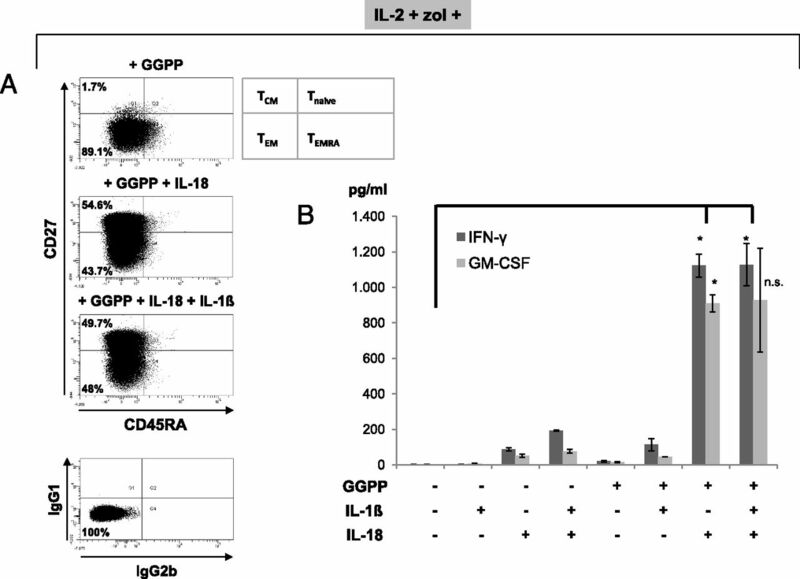 Effect of IL-18 on expansion of gammadelta T cells stimulated by zoledronate and IL-2. J. Immunother. 33: 287–296.
. 2011. Involvement of CD56brightCD11c+ cells in IL-18-mediated expansion of human γδ T cells. J. Immunol. 186: 2003–2012.
. 2012. B7-CD28 costimulatory signals control the survival and proliferation of murine and human γδ T cells via IL-2 production. J. Immunol. 189: 1202–1208.
. 2011. CD70-CD27 interactions provide survival and proliferative signals that regulate T cell receptor-driven activation of human γδ peripheral blood lymphocytes. Eur. J. Immunol. 41: 195–201.
. 1995. Cloning of a new cytokine that induces IFN-gamma production by T cells. Nature 378: 88–91.
. 1994. Inactivation of interleukin-1 beta converting enzyme by peptide (acyloxy)methyl ketones. Biochemistry 33: 3934–3940.
. 2001. Interleukin-18 regulates both Th1 and Th2 responses. Annu. Rev. Immunol. 19: 423–474.
. 2012. γδ T-cell conference 2012: close encounters for the fifth time. Eur. J. Immunol. 42: 3101–3105.
. 2013. Regulation of mevalonate metabolism in cancer and immune cells. Biochim. Biophys. Acta 1831: 1009–1015.
. 2001. Structural features of nonpeptide prenyl pyrophosphates that determine their antigenicity for human gamma delta T cells. J. Immunol. 167: 36–41.
. 2008. Isopentenyl pyrophosphate-activated CD56+ gammadelta T lymphocytes display potent antitumor activity toward human squamous cell carcinoma. Clin. Cancer Res. 14: 4232–4240.
. 2010. Cell density plays a critical role in ex vivo expansion of T cells for adoptive immunotherapy. J. Biomed. Biotechnol. 2010: 386545. doi.10.1155/2010/386545.
. 2012. Regulation of dendritic cell development by GM-CSF: molecular control and implications for immune homeostasis and therapy. Blood 119: 3383–3393.
. 2005. Professional antigen-presentation function by human gammadelta T Cells. Science 309: 264–268.
. 2010. Prolonged antigen survival and cytosolic export in cross-presenting human gammadelta T cells. Proc. Natl. Acad. Sci. USA 107: 8730–8735.
. 2011. Searching for “signal 2”: costimulation requirements of γδ T cells. Cell. Mol. Life Sci. 68: 2345–2355. 2008. Human natural killer cells. Blood 112: 461–469.
. 2011. Discovery of IL-18 as a novel secreted protein contributing to doxorubicin resistance by comparative secretome analysis of MCF-7 and MCF-7/Dox. PLoS ONE 6: e24684.
. 2005. Understanding the generation and function of memory T cell subsets. Curr. Opin. Immunol. 17: 326–332.
. 2004. FcgammaRIII discriminates between 2 subsets of Vgamma9Vdelta2 effector cells with different responses and activation pathways. Blood 104: 1801–1807.